UK to Block and Ban Social Media sites to Control Riots! So is this really fair and will social media sites play along? Today, UK prime minister David Cameron told the parliament that in the wake of this week’s riots the government is looking at banning people from using social networking sites such as Twitter and Facebook if they are thought to be plotting criminal activity. The prime minister said the government will review whether it is possible to stop suspected rioters spreading online messages, in his opening statement during a Commons debate on Thursday on the widespread civil disorder for which MPs were recalled from their summer recess. Cameron said the home secretary, Theresa May, will hold meetings with Facebook, Twitter and Research In Motion within weeks to discuss their responsibilities in this area. 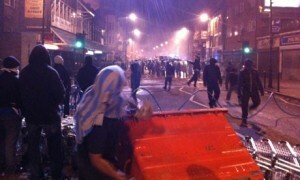 The prime minister also said that broadcasters – including the BBC and Sky News – have a responsibility to hand unused footage of the riots to police. Past attempts to force broadcasters to hand over their footage have been met with fierce resistance. On Wednesday, the BBC’s head of newsgathering, Fran Unsworth, said voluntarily giving unused footage to the police would damage broadcasters’ editorial independence. “Everyone watching these horrific actions will be struck by how they were organised via social media. Free flow of information can be used for good. But it can also be used for ill. And when people are using social media for violence we need to stop them. So we are working with the police, the intelligence services and industry to look at whether it would be right to stop people communicating via these websites and services when we know they are plotting violence, disorder and criminality”, he said. The prime minister made the announcement as he vowed to do “whatever it takes” to restore order to the nation’s streets after four nights of unprecedented civil unrest. A move to disconnect potential rioters would mark a huge shift in Britain’s internet policy, with free speech advocates likely to accuse the government of ushering in a new wave of online censorship. Scotland Yard has made a string of arrests of people suspected of inciting the violence across England by using BlackBerry Messenger, Twitter and Facebook. Cameron urged Twitter and Facebook to remove messages, images and videos that could incite more unrest across the country. “All of them should think about their responsibility and about taking down those images,” he said. If Twitter and Facebook did not comply, the government will look into completely blocking access to the sites until further notice. Now that is something these social media sites are unprepared for. Pass the Social Media Sobriety Test before posting on Facebook! Microsoft Launching its Own Social Networking Product! Next iPhone 5 to be launched on September 7! Wait, so they’re thinking of getting rid of all social media, or just people who have been rioting? Blogs seem to be reporting it in different ways, if it’s everyone then these riots are terrible and have hurt normal people, and now they’re going to affect everybody in the UK. I’m not saying the riots and withdrawal of Facebook are comparable, but still it means the rioters have done what they want, disrupt as many people as possible. If it’s just to the rioters then that’s a very good move, and I hope will restrict the possibility of these riots happening in the future.